Rainbow Falls is a beauty. Its combination of height and power are almost unmatched (save for perhaps Linville and Whitewater falls). This one is known for its rainbows, which can be seen in the ample mist they produce. 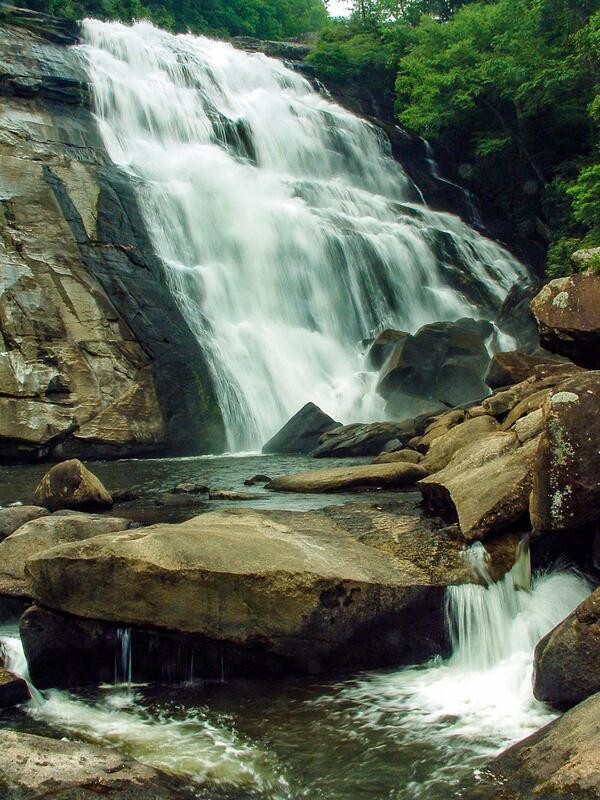 The falls are located on Nantahala National Forest property, but accessed from Gorges State Park's Grassy Ridge access. The moderate, 1.5 mile Rainbow Falls trail leads to the falls from below. From downtown Brevard, it is just over 18 miles on US 64 West to the intersection with NC Hwy 281 South - turn left. From Highlands, it's just over 20 miles on US 64 East, thru Cashiers, to NC 281 South - turn right. Go 0.9 miles South on NC 281 from US 64 to the park entrance road on the left. It's a little over a mile straight on the main road to the parking area for the Rainbow Falls trail. Park there. Start the hike on the trail leading away from the sign boards. The first section of trail you will hike has a gravel surface. It leads gently uphill at first, but very soon begins descending. From the very beginning, you can hear the roar of the Horsepasture River in the valley far below, which you'll reach in about 1 mile. The trail winds downhill through a ridge-top forest and intersects an old roadbed just after a hairpin turn. Bear right to continue on the trail. Once it crosses onto the National Forest - and into the Horsepasture Wild and Scenic River corridor - the trail is no longer gravel-surfaced and blazed; however, it is easy to follow. It's the same old road bed you were on before anyhow. The trail descends a bit more steeply to another, larger creek crossing. You'll get your feet wet on this one if the water is up. This frontal view of the falls is the best place to see the rainbows in the mist that give the falls its name. They're primarily visible in the morning, when the sun is low. They're also notoriously difficult to photograph, since when the sun is shining, the light is not always the best - and the mist will be constantly trying to soak your lens and ruin your camera. The opening is thought to be kept open naturally by the constant spray mist and wind from the falls. During floods, the wind coming up the slope here is almost enough to knock you off your feet! The trail goes through the mist zone and goes back into the forest on the other side of the opening. A side path splits left just before the trail goes back into the forest. This little spur runs close to the base of the falls on the right side, to a neat view from beside the cliff. Other scramble paths lead to the rocks in front of the falls, but if you choose to go that way, be extremely careful. The strong sun and constant mist make all the mud, grass, and rocks get covered by a slippery slime, making them almost impossible to navigate. You'll get soaked, too. You can return to your vehicle from here to make this a 3-mile round trip hike as officially advertised by the State Park. However, the trail continues about a half mile further upstream to a couple of smaller waterfalls, if you're interested. See also Turtleback Falls and Drift Falls for more information.